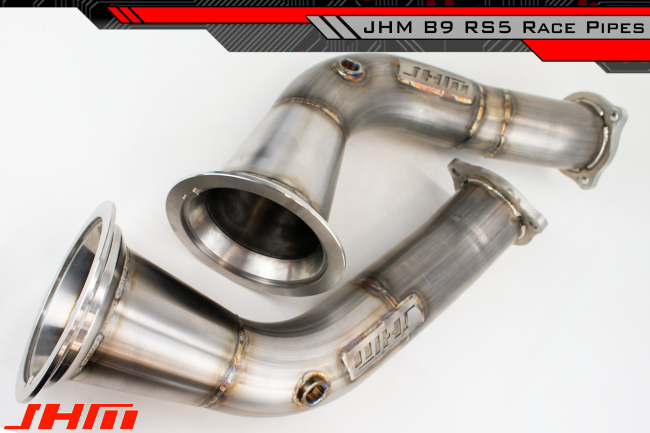 Introducing the JHM B9 RS5 2.9T FSI Race-Pipe!!! NOTE: Most of the industry refers to this style pipe as a "Test Pipe" we call it a race pipe to further clarify this product is for Racing Competition only and is not legal for use in highway or street vehicles or other non-racing competition off-road vehicles. By purchasing this product you acknowledge its intended use. 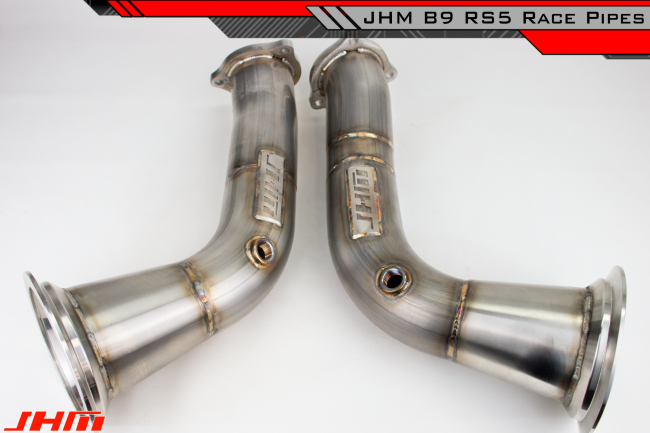 Following the release of our Race Pipes for the B8 & B9 3.0T FSI Motor, we are pleased to announce our JHM Race Pipes for the B9 RS5 2.9T FSI V6. 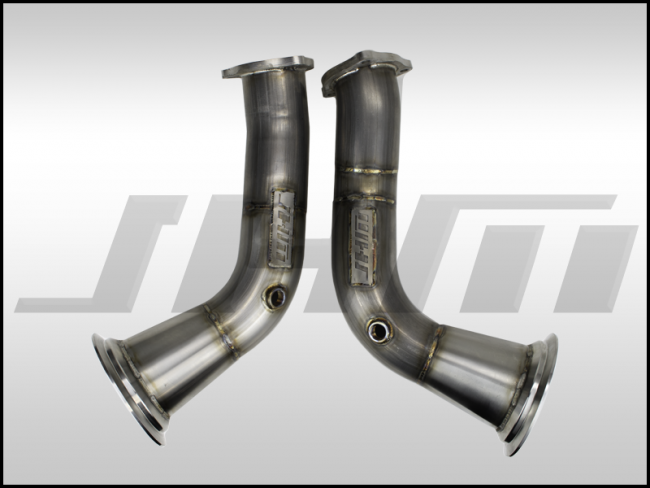 Based on our development experience of performance exhaust components we have produced a high-performance race pipe for the 2.9T FSI that fits just like OEM. WHY THE JHM RACE PIPE? The OEM cat-pipe is extremely restrictive and will limit the amount of power the 2.9T FSI can produce. 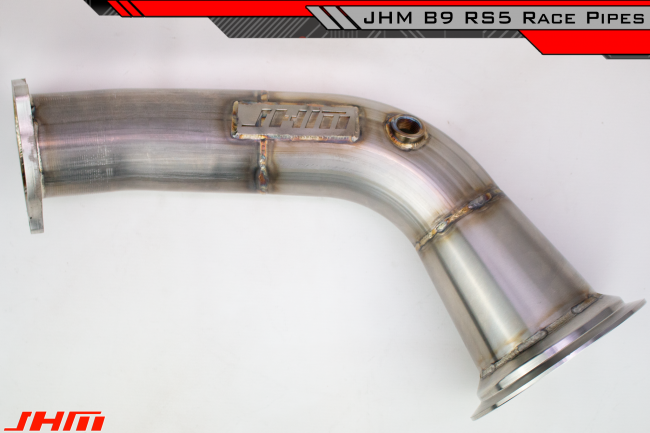 Our JHM B9 2.9T Race Pipe is a must have item for any 2.9T FSI owner looking to make serious power from their vehicle. 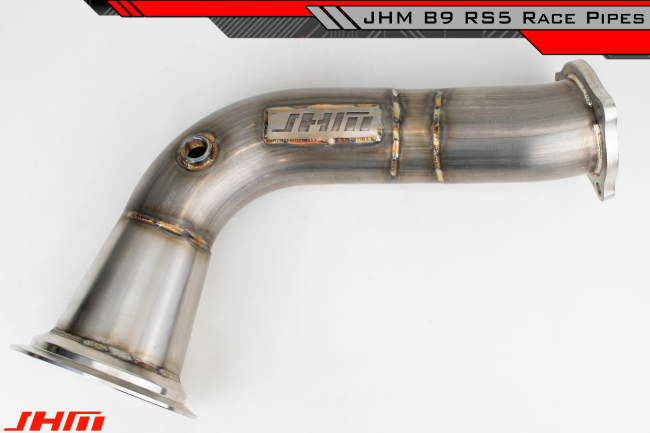 Our JHM B9 RS5 2.9T Race Pipe is packed with features geared towards Optimal Performance and OEM Fitment. Starting from the OEM 4" diameter flange that incorporates the same keyed design as your stock cat allowing perfect fitment without any guesswork and a Stainless Steel 4" to 3" Transision Cone for unobstructed flow that ends at a 3" ID Flange for no restriction caused by the Race pipe itself. When mated to our B9 RS5 Downpipes (coming soon) there will be a complete unobstructed flow of exhaust gasses for optimal performance. FITMENT: These Race Pipes fit ALL B9 RS5s with the 2.9T FSI V6 Engine. It will install in your car just like the OEM Cat Pipes that they replace. These pipes are made in a comprehensive jig to insure proper fitment, everytime. PROUDLY MADE IN THE USA, WITH USA SOURCED MATERIALS FOR THE BEST POSSIBLE QUALITY!